I still remember the first time I realized I could buy food with an app. It was years ago in New York City, one of the first real hubs that adopted the movement, and the result was a pretty amazing experience. It sounds silly given how rudimentary it is, but the ability to lie in bed, order whatever through an interface that didn’t involve technology from the ‘90s (which is still a thing), have it draw directly from my payment method of choice, and arrive is a great feeling. So the service I talked about above? That was Seamless. Although I’ve gone on to try many apps since then, this is the one I’ve had the best experiences with when it comes to communication and ease of ordering. Your mileage may vary depending on the client involved of course, but based on my use the folks at Seamless have tried to make it right. It helps that all of the information, including the total breakdown of the price, is really easy to read. If you want, you can swap to a PC to log into your account in case don’t want to be tethered to the app. Grocery stores are scrambling to meet demand with proprietary services like Giant’s Peapod, and with good reason—services like Instacart are eating their lunch if they aren’t involved in deals like this. What started as a scan-in-store service is now a full-on delivery app, and you can add items as minute as produce to your cart. The best part is that they have a ton of vendors involved from Whole Foods to Wegmans, so you don’t have to give up your favorite store if you’re up for paying a fee. 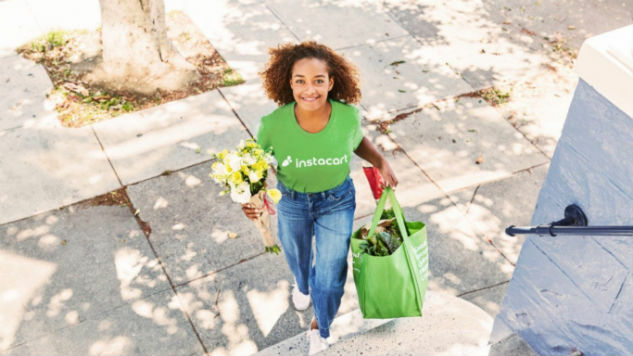 Like most food-based apps its only available in certain areas, but expect a nation-wide rollout of this type of service in the future, whether Instacart is involved or not. Food apps really don’t need to sell you as hard as say, a furniture store. Foodstuffs are typically one of the cheapest things you can possibly buy, and odds are if you’re looking at an app like this you’re hungry—that’s pretty much all the selling power a firm would need. Eat24 makes this a little easier (and thus devious) with high-res food pictures, as well as a soothing crimson hued interface that’s reminiscent of Yelp, its parent company. Because of the built in UI tweaks that Yelp has fine-tuned over the years, it’s an easy app to flip around. Folks have had mixed experiences with actually ordering from Eat24, but if they can fix their customer service they have a nice app and infrastructure to work with. Apps are often so centralized that your phone can get out of hand if you’re juggling too many of them. Folders helped, but now users have full folders and it’s annoying to keep flipping through options all the time. Delivery.com is a quasi-solution given that it’s a jack of all trades, but as the saying goes, it’s a master of none of them. There’s food, alcohol, and if you really need it, laundry and dry cleaning. Delivery.com’s attempt to literally do it all can result in mixed experiences, but the idea of a one-stop shop was intriguing enough for me to check it out. Although I’ve only partaken in “one thing” of each variety, so far I don’t have any major complaints. Photo by Eamonn M. McCormack / Stringer / Getty Images. Times have changed, and Amazon is getting with the times. What was once a “whenever you happen to get it in the mail” kind of storefront quickly moved into two-day shipping as a standard, then one-day shipping, then same-day shipping, then on-demand. As a service that’s exclusive for Amazon Prime members, the “Now” initiative basically lets you get stuff within an hour, sometimes less. Given that you can get a new electronic device, some batteries, and some groceries in the same breath for relatively competitive price points, it’s really hard to beat it. Granted you do have to subscribe to the pricey Amazon Prime (which is increasing its yearly fee over time) and pay a delivery fee and (hopefully) tip the driver, but if you really need a pair of socks and can’t leave your house, it’s often the quickest option. With Amazon’s recent acquisition of Whole Foods, the future of Amazon’s on-demand delivery service will only grow from here.